Interesting old city, Spanish and Italian architecture abounds. 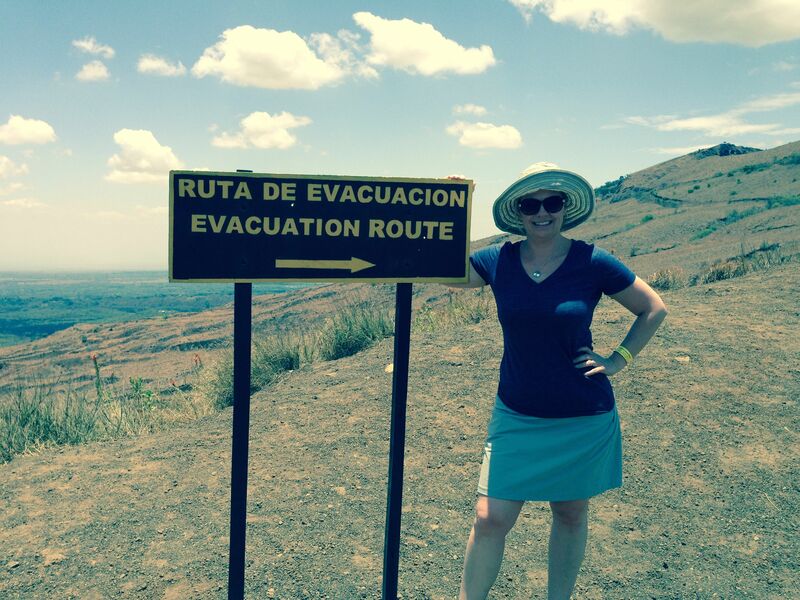 Views of volcanoes and Lake Nicaragua. We enjoyed a most scenic drive — something we missed the night we arrived in the dark, and felt like that journey was a great window into Nicaragua. As views of Ometepe Island faded away, we passed through rural Nicaragua. Farms dominate the landscape, with small villages of shacks mixed with more substantial homes. Fruit and vegetable stands line the highway — which is a two lane road carrying everything from private cars, public buses (which are decommissioned US school buses, painted in wild patterns and colors in Nicaragua,) farm vehicles, horses (the most popular transportation in Nicaragua) and bicyclists and pedestrians. As we got closer to Granada, another volcano came into view: Mambacho. Our arrival in Granada was very exciting for everyone — the kids saw the pool, I got air conditioning and brewed coffee, and we got that thrill that you get when you know you are about to experience a whole new kind of adventure! We all joked that being in the city now, we wouldn’t be hearing the roosters every day. Wrong. We heard them, but they had to compete with typical city noises for our attention. Arriving in the afternoon left little time to explore before sundown. We walked from our amazing oasis of a hotel, Hotel Xalteva, down the main road, and took the advice of our hotel manager and climbed the bell tower at the town’s central church, Iglesia de La Merced where we enjoyed an amazing 360 degree view of the entire city. We also discovered Cafe de las Sonrisas, a local nonprofit that trains at risk youth in hammock making (we later returned to purchase our amazing hammocks!) Our walk continued down the main road to the center square of Granada, just as evening fell. To say the sound of the birds in the main park was deafening is fair. We couldn’t talk comfortably amidst their noise, and quickly moved out of the park to a hotel patio for a delicious meal at the Hotel Colonial. The meal was delicious (and the kids were even able to get hamburgers) and we saw a steady stream of small craft artisans selling us their wares (which made souvenir acquisition super convenient!) Finally we made our way back to the hotel for a much needed night of air conditioned sleep. The walk back was much easier, as the crowds on the city streets had faded away, and it only took us 10 minutes to get back. 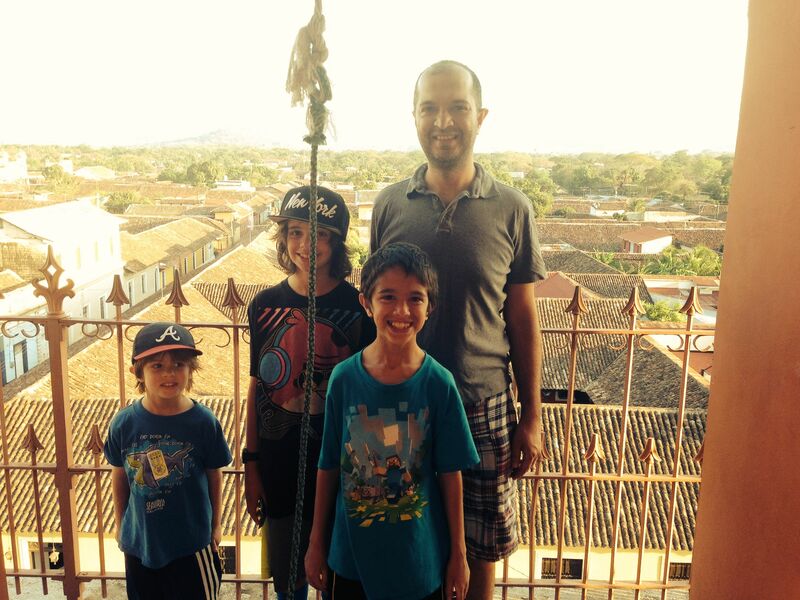 The next day, Tuesday, was really our last day in Nicaragua. While enjoying an array of fresh local fruit and good coffee by the hotel pool, the American hotel manager spoke with us for a long while, helping us determine how best to spend our day. She arranged for a private car to pick us up at the hotel, and we had the adventure of a lifetime! 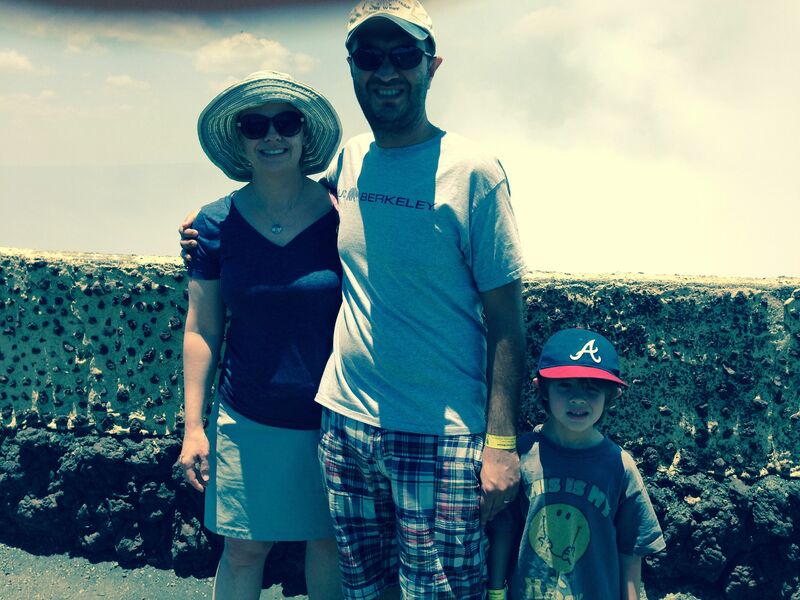 Comfortable in the touring van, our fist stop was a national park, and visit to an active volcano! This part of the day was a favorite of my mom and husband, and thrilling for all of us (no doubt more so given the tremors only the week before!) We spent an hour or so at the museum, where my kids made the connection between their geography lessons from school, and their knowledge of the layers of the earth, and real life. A well done museum, with the bonus of fabulous views of lava fields. 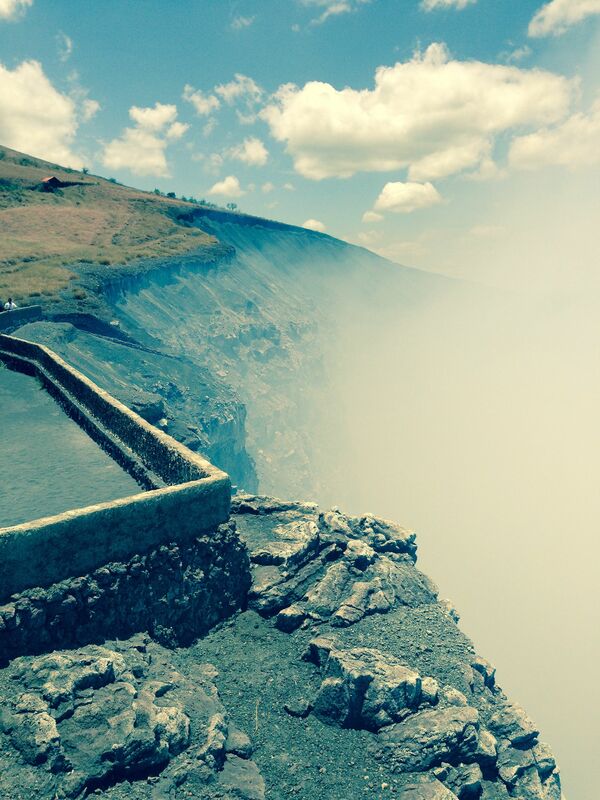 Next, our driver took us to the top of the crater, where a short wall separates life from lava. The sulfur steam from the volcano makes seeing down impossible, but the power and magnitude of staring into a volcano was not lost on us. Honestly, being in front of this active volcano was far more exciting and worthwhile than any of the online descriptions or pictures made clear beforehand. After a touristy lunch in another quaint town, overlooking a beautiful crater lake, we set off to explore a community where everyone has a kiln. The only school in the town teaches the ancient craft of pottery making, using manual wheels, locally mined clay, and natural earth dyes. 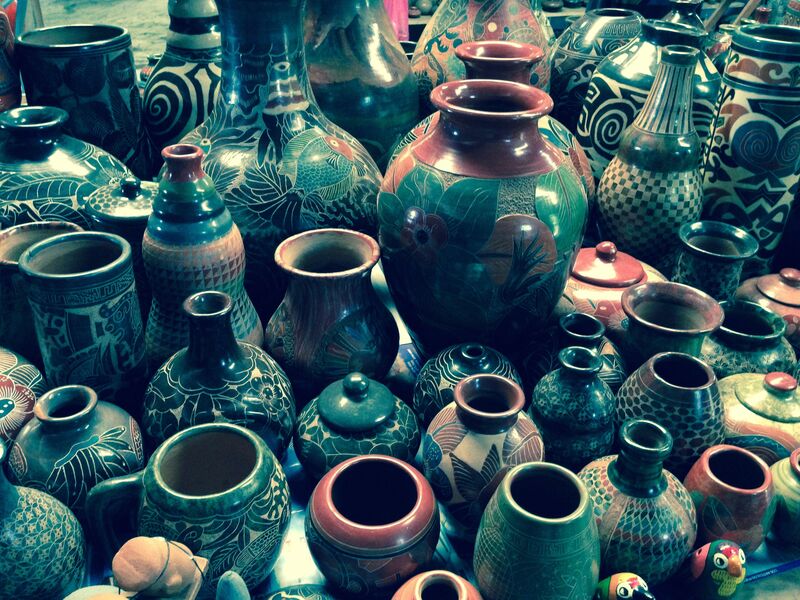 The town’s industry is primarily for export, though you can buy the handmade creations in local shops as well. causing us to invest heavily in Nica chocolate for souvenirs, the chocolate we returned home with was not good — dry and tasteless. nd took a final dip in the pool. Our car arrived at 4am for our trip to the airport, and we enjoyed a quiet pre dawn drive from Granada to Managua.